Welcome to a Deflategate Free Zone. Besides all that Tom vs. Roger way way way too much ado about zilch has been bumped from the sports pages like a Hanson Brothers hipcheck by the big question of the week. Who’d win a smackdown between this week’s premier badasses? In one corner, there’s Dez Bryant, who, in his most recent scuffle, drew a no discernable winner practice field push and shove with wannabe Dallas DB Tyler Patmon. Who happens to be a fellow former Okie State Cowboy. 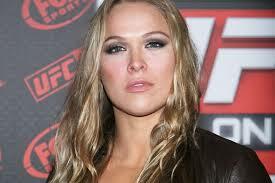 In the other corner, we are smitten with the baddest dudette — perhaps ever — on the 3d Rock from the Sun, Ms. Ronda Rousey.